Since 1977 Accurate Heating and Cooling has provided expert furnace repair, sales and service to keep families comfortable and warm all winter long. At Accurate Heating and Cooling, we service and repair all makes and models of heating systems. Our factory trained and NATE certified technicians will expertly diagnose, repair and service your furnace or HVAC to restore maximum efficiency and comfort. We offer 24 hours service 7 days a week. We repair all brands and models of furnaces including oil furnaces, electric furnaces, gas furnaces, heat pumps, geothermal heat pumps and boilers for residential and commercial. We offer priority emergency service for our service plan members click here for information about ourservice plans. Need a Furnace replaced or Installed? Learn about the different types of heating systems we offer. WHATS THE AFUE RATING ON FURNACES MEAN? Furnace Efficiency Rating All of today's Furnaces and Boilers efficiency is measured by annual fuel utilization efficiency (AFUE). To be more specific, AFUE is the ratio of annual heat output of the furnace or boiler compared to the total fossil fuel energy consumed by a furnace or boiler in the period of a year. For example a furnace rated at 80 AFUE means for every dollar you spend to heat your home 80 cents is returned in heat and 20 cents is lost. The AFUE rating does not include how much heat energy is lost through the ductwork of the heating system. Leaking ducts or duct work running through a cold attic will increase how much is lost. An 80 AFUE rated furnace compared to older furnaces which recover only 45-65 cents worth of heat, these 80 AFUE furnaces are affordable and good choices for your home. To get the maximum return on each dollar spent on fuel, a 98% plus operating furnace is the best fossil fuel option available. Each dollar spent in natural gas used can bring over 98 cents back in heat to your home. At Accurate Heating and Cooling we offer furnace systems from 80 AFUE to 98.3 AFUE to help fit your budget and comfort and to lower your monthly heating bills. Please give us a call today to find out more or to schedule your free in-home consultation on a new furnace or central air system. A HYBRID HEAT dual fuel system combines the strengths of a gas furnace with an electric heat pump to deliver the comfort and efficiency you need in both warm and cold seasons to give you more control over your utility bills. As outdoor winter temperatures change, the system automatically switches between heat pump and furnace to utilize the most cost-effective fuel source and maintain greater efficiency. HYBRID HEAT is so efficient, its heating costs are less than with any gas furnace alone. According to the U.S. Environmental Protection Agency, geothermal systems are "the most energy-efficient, environmentally clean, and cost effective space conditioning systems available today." That's because a geothermal system taps into the earth to capture free, renewable energy. The earth absorbs about 47% of the sun's energy that reaches it, storing that energy in the ground. A geothermal system extracts that free energy for heating during winter. For cooling, the system removes heat from the home and dumps it into the cooler earth. This transfer of heat energy is done through a series of lines buried in the ground, or sunk in a pond, or by using well water. Because a geothermal system simply moves heat instead of burning a fossil fuel to generate it, it's more energy-efficient. Accurate Heating and Cooling's factory trained installation technicians have installed over 250 Geothermal systems in South Central Ohio. click here for more information. When working with customers to provide an estimate to replace or install new heating and cooling equipment, we offer customized recommendations that include good (less up front cost and moderately efficient - 80-90 AFUE), better (slightly higher upfront cost but more efficient to operate - 90-95 AFUE) and best (larger upfront investment with significant utility cost savings - over 95 AFUE). The customer can then select which option best meets their needs. Typical duct systems can lose as much as 25 to 40% of the cooling or heating energy put out by the HVAC system. Leaks, one way in which conditioned air is lost in the duct system, make the furnace or central air system work much harder, thus raising your utility bill. Duct leakage can decrease your comfort, and cause health and safety issues. 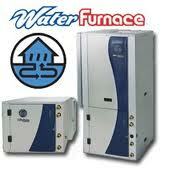 We carry furnaces from the top manufacturers. such as Bryant, Payne and Water Furnace.